Vijayapura District and talukas: Vijayapura is also known as Bijapur. It is located in Karnataka state. This district is well known for its historical monuments built during the rule of the Adil Shah dynasty. The city was established in the 10th-11th centuries by the Kalyani Chalukyas and was known as Vijayapura (City of victory). Bijapur is located 530 km northwest of the State Capital Bengaluru and about 550 km from Mumbai, and 384 km west of the city of Hyderabad. According to 2011 census, the population of Vijayapura was about 4 lakhs. Probably 9th highest in all over Karnataka. Vijayapura is an ancient city with five rivers and the domain of different cultures. Bijapur was the biggest district place of the state with 5 taluks. But now it has only 6 taluks as it is now divided with Bagalokote. Vijayapura consists of three distinct portions: the citadel, the fort and the remains of the city. The district is bounded by Solapur district on the North and Sangali on the North-West, Belgaum district on the West, Bagalkot on the South, Gulbarga on the East and by Raichur on the South-East. Vijayapura has an average elevation of 883 meters or 2896 feet. 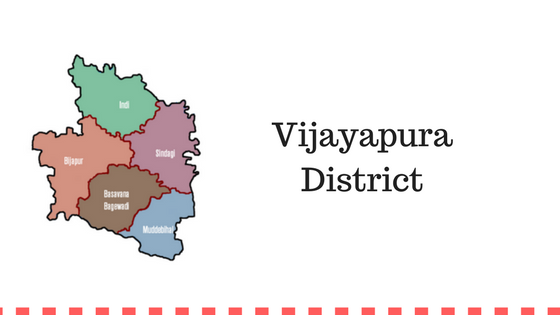 Vijayapura has an average literacy rate of 64% which is higher than the national average. Vijayapura is an important tourist place in the country with lots of options like Anand Mahal, Jod Gumbaz, Jumma Mosque, Sat Manzil, and Jal Manzil. Bijapur has a semi-arid climate. In summer, especially in April and May, it is too hot. In the winter season, from November to January the temperature is comfortable around 15-20 degree Celsius. In the rainy season, it rains heavily. The district has two types of soil.First one is deep black soil and another one is red soil. Transportation facility is also great in Vijayapura. Overall it is rich in history with some great places to see.